Alberobello, a Unesco Heritage thanks to its white trulli symbol of Puglia. Ideal for couples of all ages looking for privacy.Charming suggests you to rent a car to reach your desired Hotel. In the heart of the lovely town of Alberobello, famous for its Trulli (conical constructions typical of the area) is located Le Alcove Hotel. It has a great position as it is located in the city's main square, 200 m from the historic center and approx. 110 km from Castel del Monte, Unesco heritage. Locorotondo is only 8 km and covering 18 km you can visit the Zoo Safari of Fasano. The nearest airports are Bari (55 km) and Brindisi (75 km). 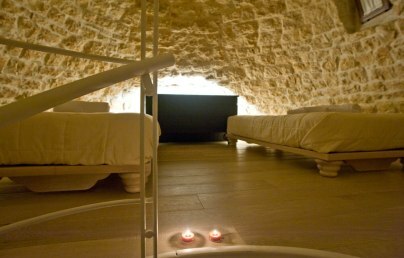 The Trulli, characteristic buildings of white stone, have been carefully restored to create Le Alcove, a luxurious hotel in the Trulli. 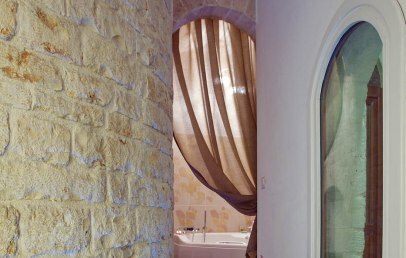 A blast from the past and tradition, comfort and privacy are key ingredients of the accommodation offered by Le Alcove, during which the quality of service and relaxation are guaranteed. Children aged over 10 years are welcome. 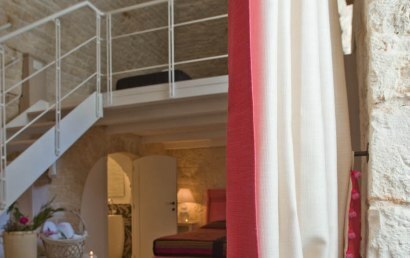 Le Alcove offers a total of nine rooms, seven of which (Suites) are in the main square, while the other two are a short walk from the central block. They all have a private entrance and are furnished in different ways. They are all made of white stone, characteristic of the area, and are equipped with modern amenities to ensure maximum relaxation. The Resort offers its guests a breakfast service. To start the day in the best way day, the products offered by the Hotel are genuine, some of them biological, confirming the high level of quality that characterizes Le Alcove. Internet WI-FI is available in all rooms and common areas, free of charge, as well as the use of the minibar in the rooms. Tourist Tax – the municipality requires the payment of Euro 1,00 per person per overnight for the first 3 consecutive overnights. This tax has to be paid on spot. 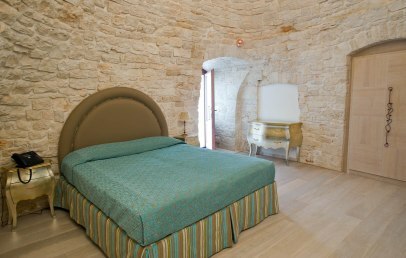 Double room for single use, located in a Trullo at walking distance from the main building. It is characterized by parquet floor and beige tones. 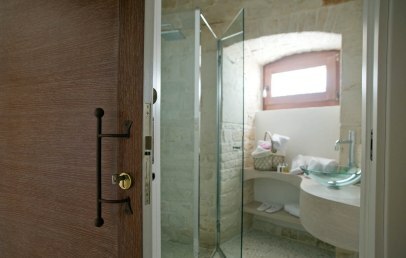 The private bathroom, refined with presents calcareous cobblestones, has a shower. The Deluxe rooms have a garden view. 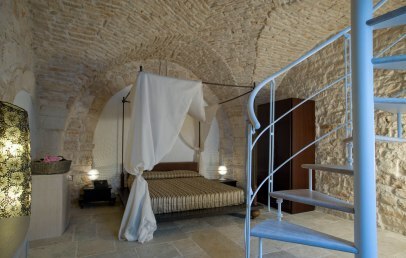 Comfortable Suite with barrel vault, iron bed, all made of white stone, characteristic of the area and are equipped with modern amenities and green drapery. 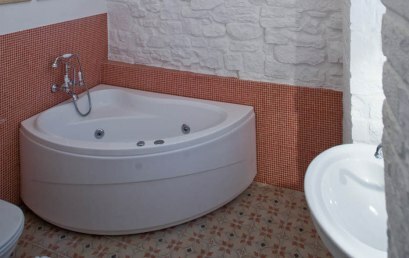 The private bathroom, refined with a precious coral red mosaics, has a Jacuzzi bathtub. The independent entrance consists of a private patio in the garden side. Luxury Suite characterized by traditional details and modern amenities. All made of white stone, characteristic of the area, and refined with ceramic lamps typical of Grottaglie. 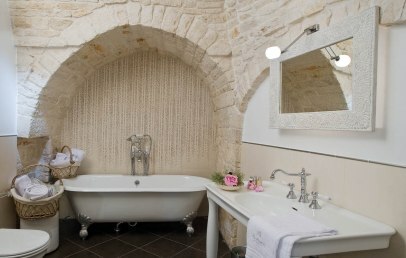 The private bathroom is equipped with ancient-style bathtub or shower. From the garden you reach the independent entrance of the Suites. Spacious loft Suite with a four poster bed and two twin beds located on the second level. The Top Suite is characterized by beige and brown tones and by a fascinating floor in local stone. The bathroom is equipped with a Jacuzzi bathtub. From the garden you reach the independent entrance of the Suites. Puglia: Take a luxury break from the hot summer!